Nigeria Vs Argentina: "Ahmed Musa May Land In Trouble. 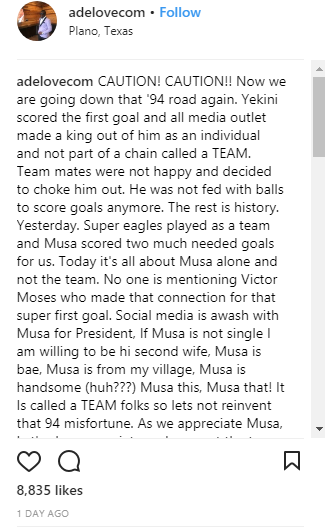 See The Reason"
Few Days Ago Footballer Ahmed Musa became the Hero of Nigerians after he Scored 2 goals against our Match with Iceland, Since then almost all the Praises have been going to him. However Popular Abroad Nigeria Philanthropist Adelove has Warned Nigerians of Possible History that is About to repeat itself, He shared a Throwback Photo of Nigeria Winning a Match During the World Cup, But Loosing after Too much Celebration..
”CAUTION! CAUTION!! Now we are going down that ’94 road again. Yekini scored the first goal and all media outlet made a king out of him as an individual and not part of a chain called a TEAM. Team mates were not happy and decided to choke him out. He was not fed with balls to score goals anymore. The rest is history. Yesterday. Super eagles played as a team and Musa scored two much needed goals for us. Today it’s all about Musa alone and not the team. No one is mentioning Victor Moses who made that connection for that super first goal. Social media is awash with Musa for President, If Musa is not single I am willing to be hi second wife, Musa is bae, Musa is from my village, Musa is handsome (huh???) Musa this, Musa that! It Is called a TEAM folks so lets not reinvent that 94 misfortune.